NEW DATE! Due to the weather, Porchfest has moved to Monday, Columbus Day. PORCHFEST - Monday, October 10, 2016 2 - 4 p.m.
Maps will be available online and at each porch during the stroll from 2-4 pm. In the event of rain, Monday Oct. 10th (Columbus Day) will be the rain date at the same time. 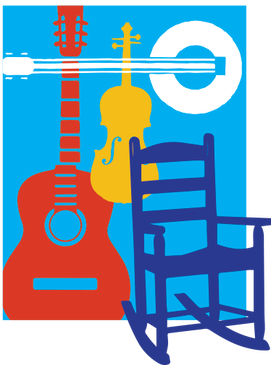 On Sunday afternoon October 9th, from 2-4 pm, we will host our first annual Porchfest as part of our Fall for the Arts program. Enjoy a pleasant afternoon sauntering with your friends and family through Sandwich Village while listening to a variety of musicians performing along the way. It might be reggae, blues, jazz, pop -- all genres are welcome here. Sandwich's first-ever Porchfest is free, and will include musical artists such as singer/songwriters, duos, small groups, guitarists, and other instrumentalists playing from porches in front of 10 area businesses and historic homes along Main, Jarves, School and Summer Streets. In keeping with the national "Porchfest" movement, which supposedly started in 2007 in Ithaca, NY, a map will guide listeners along a looping route that will not include microphones or amplification. Similar events have or will occur through the year in about 6 towns in Massachusetts, including the one just held in Wellfleet at the end of August. The emphasis is on unamplified, acoustic music and on building community. Nils has worked as a single professional guitarist and vocalist and as a member of East Coast working bands ranging from the Canadian border to the famous hotel venues of the NY Catskills, Florida and the Caribbean. Bob Bean and Norm Silver are acoustic musicians who plays a wide variety of genres from folk to rock and everything in between. Jim and Steve have a nice blend of vocals and blues harmonica. They are joined by the very talented Brian Sances who adds his percussion to round out the performance. Brian released his debut album “Here Today” in 2010. A guitar duo "of older guys" who are well versed in acoustic Americana, folk rock, and singer/songwriter tunes along with a small touch of bluegrass. Schuyler Grant’s music, a Blues-driven Americana, is greatly influenced by his years in New Orleans and Manhattan’s West Village. He recently released his first studio album, “Moving On”. Steve currently plays guitar and sings with the Cape Cod jazz/pop duet, Two Cool. The owner of Score Music, Steve also conducts Ukulele series of classes and Ukulele Kidz series of classes at neighboring cultural institutions. Sam Holmstock, a founding member of the band Entrain, has taught of Afro-Caribbean drumming for 30 years. In addition, Sam facilitates Drumming through Trauma, designed for veterans with Post traumatic Stress Disorder. Still Willow is the acoustic singer-songwriter duo influenced by a variety of genres including Folk, Americana, and a myriad of singer-songwriters both old and new. "2 out of 3" is a multigenerational family band of fiddlers from Cape Cod consisting of Heather Swanson, Krista Signs, Clara Signs and Caitlin Signs, who blend genres by combining light Classical tunes with Traditional music. Founding members of the Cape Cod Guitar Ensemble, a primarily classical ensemble, John & John share an appreciation for all things guitar. They will perform a selection of acoustic blues and other favorites.